It has been proposed that sailing can improve quality of life, personal and social skills of people with severe psychosocial disabilities. This study aimed to assess the efficacy of a psychosocial rehabilitative intervention focused on sailing on quality of life, self-efficacy and sense of coherence in people with severe psychosocial disabilities. The study was a randomized, with parallel groups, waiting-list controlled trial. Participants were 51 people with severe psychosocial disabilities. The intervention was a structured course to learn sailing in a crew lasting three months. A randomized group began the sailing course immediately after a pre-treatment assessment; the waitlist group began the sailing course after a three months period of treatments as usual. Participants were assessed before and after the sailing course, or the waiting list period, on the General Self-Efficacy scale (GSES), Sense Of Coherence scale (SOC) and Health Survey-short form (SF-12). Self-efficacy significantly increased after the sailing course and decreased after treatment as usual (p=0.015). Sense of coherence and the levels of quality of life tended to improve after the sailing course, albeit below levels of statistical significance. When compared to more traditional psychosocial rehabilitative activities, an intervention focused on sailing in a crew positively impacts the sense of coherence and the levels of quality of life and significantly improves self-efficacy of people with severe psychosocial disabilities. Further longitudinal research is required. Keywords: Sailing, Sport, Psychosocial rehabilitation, Quality of life, Self-efficacy, Sense of coherence. People with psychosocial disabilities usually report poor quality of life (QoL) [1, 2] and difficulties in social functioning [3, 4]. QoL refers to the perceived overall wellbeing, including physical, psychological and social functioning . Several psychosocial factors can be related with the perceived QoL such as self-efficacy [6, 7], also in people with severe psychosocial disabilities [8, 9]. Self-efficacy is widely defined as the perceived ability to perform a task, take control of an action and/or achieve a desired goal [10-12]. It is a key concept in the theories about motivation [13-15] and healthy behaviors promotion [16, 17], such as physical activity , also in people with psychosocial disabilities . Self-efficacy can be considered both as an outcome of physical activity programs, which may increase the perception of being in control of actions, and a determinant of adherence in attending them, since people with higher self-efficacy are more likely to pursue goal-oriented programs [20, 21]. Beside self-efficacy, wellbeing is related to a strong sense of coherence (SoC) and a positive perceived QoL [9, 22, 23]. SoC concerns the ability to understand, manage and give meanings to life events, in order to maintain good health and wellbeing . A strong SoC is associated with higher levels of moderate to vigorous physical activity in young adolescent  and improves in people with severe psychosocial disabilities attending structured activities, such as a sport, in the form of lifestyle intervention program . SoC is associated with QoL and perceived health in both Western and non-Western countries . Moreover, SoC is strongly related to perceived health, especially mental health , so it is important to take it into account evaluating the impact of a treatment on QoL in people with psychosocial disabilities. Interventions aimed at improving self-efficacy and SoC might have important effects in people with psychosocial disabilities well beyond their impact on QoL and wellbeing. Psychosocial disabilities cause an elevated burden on the affected people in terms of lost opportunities. Self-perceived stigma further increases the sense of inefficacy because of lost opportunities that is caused by psychosocial disabilities. When people are offered a chance of employing their time in activities from which they are often kept apart, they benefit from the opportunity . In addition, the stigma attached to psychosocial disabilities makes worse the perceived QoL of people affected more than in other diseases . In particular, the belief that not only individuals with a psychosocial disability are incurable, but also that their disability is irreversible, is deeply rooted both in public opinion and among health workers . The bio-psychosocial model of disability proposed by the the World Health Organisation in the International Classification of Functioning Disability and Health – ICF  outlines that disability is a complex phenomenon, reflecting an interaction between individual characteristics, also about the body, and features of the society in which the individual lives. Hence, many aspects of disability are socially and environmentally determined issues and not all attributes of an individual. This model states that the community has the responsibility to recognize disability and provide supports for people with disabilities, in order to facilitate their participation as equal and valued citizens. It might be advanced that a rehabilitative program, able to increase self-efficacy and SoC of the participants, might improve their QoL and wellbeing, as well as might reduce self-perceived stigma, one of the mechanisms that could contribute to the persistence of stigma in the society . Sport activities and exercise are often used to implement rehabilitative programs for people with psychosocial disabilities, since they join an entertainment function with socialization goals and other, more specific aims . Within this perspective, sport activities might exert a strong antidote against stigma . In our culture, sport activities are socially appreciated and they are considered as a powerful vehicle to promote social relations, and physical and psychological wellbeing. Furthermore, people with severe psychosocial disabilities often reported higher levels of sedentary behavior during waking hours . Several systematic reviews and meta-analyses point out that physical activity and sports can be proposed as a potential treatment to improve mood in people with depression [32-38], as well as health outcomes  and QoL  in people with schizophrenia. Indeed, sport activities have often been proposed as rehabilitative interventions for people with severe psychosocial disabilities [39, 40]. Recently, a randomized controlled trial (RCT) [41, 42] evaluated the efficacy of a rehabilitative intervention focused on sailing on several clinical and psychosocial outcomes of people with severe psychosocial disabilities. Based on recovery promotion , this study pointed out the efficacy of sailing to improve the quality of life, social skills and psychopathological residual symptoms of participating patients [41, 42]. Within this perspective, and to the goal of adapting sailing to the needs of people with psychosocial disabilities [43-48], the project “VelaMente? !” was established as a psychosocial rehabilitation intervention for people with severe psychosocial disabilities. In Italian, the word “VelaMente? !” is a pun made up by joining the words “Sailing” (Italian: “Vela”) and “Mind” (Italian: “Mente”), which literally resembles the adverbs “Really? !” or “Indeed?!”. The project “VelaMente? !” focuses on a structured course to learn sailing in a crew. This project was proposed in order to confirm and extend findings of the already mentioned RCT [41, 42] by recruiting a new sample and providing other changes: the enrollment of a wider sample of people with severe psychosocial disabilities (N 64 instead of N 40); a more structured sailing course, including theoretical and practical lessons overall similar to a basic sailing course, but adapted to the needs of each participant; the concurrent employment of sailing teachers and mental health operators; the choose of two regular sailboats usually used by crews of sailors during regattas. to verify whether sailing in a crew can improve the SoC and if this improvement is related with perceived QoL. to verify whether sailing can improve the self-efficacy and whether this improvement is related to perceived QoL. The study was a randomized waitlist-controlled trial with parallel groups, with the experimental intervention period, lasting three months, crossed between two groups (Fig. 1). A pool of 64 subjects was recruited among users of two public mental health services in Sardinia, Italy; one half of participants were from a residential mental health service of the Department of Mental Health of Carbonia-Iglesias and the others from the Center of Liaison Psychiatry and Psychosomatic, University Hospital of Cagliari. The inclusion criteria were: 1) Schizophrenia, Affective Psychosis, and/or Personality Disorder diagnosis according to ICD-10 criteria ; 2) aged ≥ 18 years old; 3) being a user of the mental health service for two years at least; 4) signing the informed consent; 5) presenting a medical note for no agonistic sport activity. The exclusion criteria were: 1) a strong medical contraindication for sport activities; 2) not being in clinical remission, with episodes of psychotic episode in the last three months. Among the starting pool, 13 (20%) users were excluded because they suffered from episodes of psychotic episode in the last three months (Fig. 2). Group B: N 28 subjects (waitlist) attending the usual rehabilitative activities in their mental health service plus drug treatment as usual (three months). Then, when the Group A completed the sailing course, they started with the experimental intervention (three months sailing course) plus drugs treatments as usual. At the end of the sailing course, they started again with the usual treatments (See Figs. 1 and 2). The experimental treatment was a psychosocial rehabilitative intervention based on learning to sail in a crew by attending a structured course. The course was conducted in a sailing school sited in a touristic harbor in the eastern part of the Gulf of Cagliari (Italy). Participants reached the harbor from their two mental health services sited in Iglesias (distant almost 75 Km) or Cagliari (distant almost 20 Km) by a caravan driven by a mental health operator. The course lasted three months, two lesson/week. Each lesson lasted almost four hours. The entire course consisted in a theoretical module of four lessons about principle of sailing (i.e. : winds and the Wind Rose; components and tools into the sailboat; knots; roles and group dynamics into a sailing crew; sails typology; maneuvers in the harbor and in the open sea; safety in the sailboat; etc…) and in a practical module of eight lessons in the open sea or in the harbor, in which the participants could apply this knowledge. The lessons took part directly on sailboats, in the touristic harbor and in the contiguous open sea, also on the bases of weather conditions, or in a dedicate room of the school. Each lesson involved a group of 8-10 participants, two regular sailboats usually used by crews of sailors for regattas, two skippers, two psychologists and two trainees attending the “Techniques for the psychiatric rehabilitation” Degree Course of the University of Cagliari, Italy. The participants were steadily motivated to enhance their learning ability and encouraged to discuss their impressions and feelings about the experience among the group or individually, in order to improve their social skills. Finally, it was spontaneously promoted the typical relaxed climate of sailing crews and environment. The rehabilitative treatment as usual (rTAU) consisted in more traditional psychosocial rehabilitation activities usually conducted in the mental health services, such as self-help groups, group-supported work in the garden, group-laboratories of art therapy. Even if they were not evidence-based psychosocial rehabilitation activities, they shared with the experimental intervention some features that allowed a comparison, such as the group setting, the possibility to socialize and to stay in outdoor places, the continuity of the sessions. The evaluators (N = 4) were blinded to the allocation of the subjects to the groups. However, since patients often talked about their sailing experience, blindness was difficult to preserve. Evaluators (two psychiatrists and two psychologists) were trained to administer the assessment instruments, and had four years professional experience at least with patients with severe psychosocial disabilities. The assessment took place in dedicate rooms into the mental health services involved in the project. As shown in Fig. (1), for the intervention group the assessment points were: pre-treatment (T0) and post-treatment evaluation (T1), before and after the sailing course; for the wait list group, the assessment points were: pre- (T0) and post- (T1) waiting list period (treatments as usual), and post-treatment (T2) at the end of sailing course. 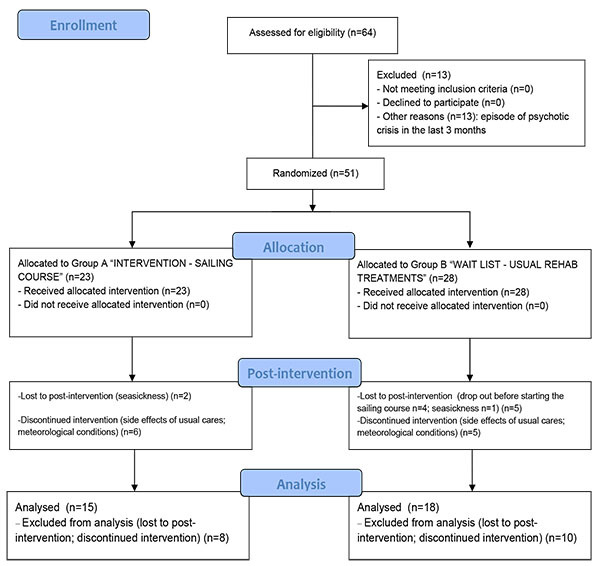 It was not possible to assess again the Group A 3 months after the post-treatment evaluation (T2) because many subjects were dismissed from their mental health service due to the end of their rehabilitative programme. The 13-item Sense of Coherence Scale (SOC)  in the Italian version  was used to measure sense of coherence. The SOC-13 is a self-report questionnaire consisting of three components: comprehensibility, manageability, and meaningfulness that are equally weighted. The items were rated on a 7 point Likert scale and the total score ranges from 13 to 91, with higher scores indicating a higher SOC. The Short Form Health Survey (SF-12)  in the Italian version  was used to measure quality of life (QOL). The SF-12 consists of two domains: mental and physical health. The items were rated by 3 or 5 points Likert scale. The total score ranges from 12 to 47, with higher scores indicating a higher QOL. The General Self Efficacy Scale (GSES)  in the Italian adaptation  was used to measure self-efficacy. The GSES is a 10 item self-report questionnaire rated by 4 points Likert scale. The total score ranges from 10 to 40, with higher scores indicating a higher self-efficacy. An ad hoc report was used to collect the socio-demographic data, clinical status and information about usual cares (see Table 1 for details). The data refer to the comparison between the subjects attending the sailing course (Group A + Group B: experimental treatment) and the subject in the wait list (Group B: usual treatments). As shown in the Fig. (2), those subjects that skipped more than more than four lessons were excluded from the analyses (n = 18, because lost to post-intervention or discontinued intervention), in order to better assess the effectiveness of the experimental intervention. Data were analyzed with the Statistical Package for Social Science (SPSS) for Windows (Chicago, Illinois60606, USA), version 21. The descriptive statistics (mean ± sd; %) were used for nominal and continuous variables to point out the characteristics of the samples (age; gender; marital status; education; diagnosis; psychosocial variables). A series of Chi-Square (nominal variables) and one-way ANOVA (continuous variables) were used to verify the homogeneity between the two groups (“experimental treatment” - “rehabilitative treatment as usual”) at T0, about all variables. A series of repeated measures ANOVA were used to assess the expected differences “time*group” for the dependent variables (“sense of coherence”; “quality of life”; “self-efficacy”). Socio-demographic, clinical and psychosocial features of the study samples at T0 are shown in Table 1. Table 1. Socio-demographic, clinical and psychosocial characteristics of the samples at T0. Any statistically significant differences regarding gender, age, marital status, education, diagnosis, levels of sense of coherence, self-efficacy and quality of life were found between the “experimental treatment” (sailing course) group to the “rehabilitative treatment as usual” (wait list) group at T0. As shown in Fig. (2), two subjects in the “experimental treatment” (sailing) group dropped out at post-treatment because seasickness and other six attended the sailing course discontinuously (more than four lacked lessons) because some sides effects of drug therapy or weather conditions that required some adjustments in the lessons program. In the “rehabilitative treatment as usual” (wait list) group, five subjects dropped out (one because seasickness; four before starting the sailing course) and five attended the sailing course discontinuously (more than four lacked lessons) because some sides effects of drug therapy or meteorological conditions that required some adjustments in the lesson program. At T0, there were any statistical differences about mean scores on GSES, SOC and SF-12 between dropped-out subjects and those included in data analyses. As shown in Table 2, there were statistically significant differences “time X group” on self-efficacy (GSES: p = 0.015), with a clear improvement for the sailing group and a decreasing trend in the wait list group. Table 2. Changes over time in measures of sense of coherence, self-efficacy and quality of life. Legend: SC= sailing course; rTAU= rehabilitative treatments as usual. It was not found any statistically significant difference “time X group” regarding sense of coherence (SOC: p = 0.357) and quality of life (SF-12: p = 0.627). However, it was observed a very low improvement trend expressed by mean scores in the sailing group and a relative stability in the wait list group on both outcomes. This paper focuses on the results of the project “VelaMente? !”, a psychosocial rehabilitative intervention with a cross-over RCT design, which was based on a structured sailing course in a crew lasting three months and involving 51 people with severe psychosocial disabilities. The results concern three well-being outcomes: self-efficacy, sense of coherence and quality of life, and the study tested the hypothesis that they were liable to improvement by a structured physical activity [19, 21, 24, 25]. The subjects attending the sailing course showed a statistically significant improvement in their levels of self-efficacy, when compared to the subjects in the waiting list group attending more traditional group psychosocial rehabilitative interventions such as self-help, gardening or art therapy in the waiting list group. Moreover, in the waiting list group self-efficacy tended to decrease. A recent pilot RCT  about the effectiveness of a psychodynamic group art therapy for people with severe psychosocial disabilities shown similar findings about self-efficacy: it improved in a statistically significant way more in the “treatment as usual” group (a mix of individual and/or group cognitive-behavioral or modify psychodynamic interventions; occupational therapy, music therapy, cognitive and social skill training, excursions, relaxation and sport) than in the “art therapy” group. Hence, self-efficacy seems to be more susceptible of improvement in people with severe psychosocial disabilities after a rehabilitative intervention including structured group activities, delivered in a non-invasive manner and with a sufficient level of challenge, as sports or an art therapy intervention. Recent systematic reviews with meta-analyses pointed out that people with severe psychosocial disabilities show lower levels of physical activity [37, 39, 40], higher levels of sedentary behaviors  and that interventions based on moderate-vigorous levels of physical activity with the supervision of qualify personnel are needed among this population, to enhance their health and wellbeing [38, 57]. It is known that physical activity stimulates the release of endorphins creating a mild sense of euphoria, and also that synchronized training in a college rowing crew creates a heightened endorphin surge compared with a similar training regime carried out alone. These evidences may explain the sense of euphoria experienced during other social activities that are involved in humans’ social bonding [58, 59]. We advance that the rehabilitative intervention focused on sailing in a crew proposed by “VelaMente? !” project produce an improvement in self-efficacy because it possesses these features: 1) it was focused on a challenging and structured course on sailing; 2) it was a group intervention; 3) it was tailored in naturalistic outdoor place, out of, and relative far from, the mental health services where more traditional rehabilitative activities are usually proposed; 4) the main role of mental health operators was to motivate attenders, facilitate the activities between the participants and the environment (i.e. : communication with skippers and sailing teachers; exploring harbor, knowledge about sailboats equipment and tools, etc…), promoting both a sense of belonging and a supportive and stimulating climate. Recent studies about the effectiveness of innovative group psychosocial rehabilitative interventions focused on sport activities and counseling , sport activity, mindfulness, psychoeducation  and job training , even when did not directly considered self-efficacy as an outcome nor mediator on outcomes, seem to provide the opportunity to enhance self-efficacy, self-esteem, self-confidence, and a positive self-image in people with severe psychosocial disabilities . As self-efficacy , SoC is a relative stable disposition of personality that is developed during childhood, adolescence, and through adulthood [63, 64] and they are both related with , and impact  the perceived QoL. In a randomized-controlled trial  about effectiveness of a lifestyle intervention on symptoms, QoL and SoC of people with a psychosocial disability, it was found that SoC significantly improved after a 12-month health intervention in the form of study circles with diet sessions and physical activities with a sufficient level of challenge that encouraged participation in a social context. In our study, the perceived QoL and SoC tended to improve in the sailing course group during the intervention, even not in a statistically significant way, when compared to the wait list group, in which subjects tended to maintain lower levels on these outcomes with a relative stability during time. Furthermore, improving trend about QoL seemed to partially confirm findings of a previous study , in which it was observed a significant improvement on QoL after a six months psychosocial rehabilitative intervention focused on sailing. It could be possible that, to observe significant improvement on QoL, as well as on SoC, requires a more lasting period of treatment. This study presents some limitations. One of these was the small sample size, even if partially moderated by the parallel groups design, with one group crossed to the experimental intervention. It has some advantages against a longitudinal model without this crossing: many subject serves as their own control, hence the effects of confounding factors are restrained. However, the small sample size did not allow to perform multivariate analyses. Another limit is the relatively high attrition rate, mainly due to the end of the rehabilitation programme in the mental health services regarding an high number of subjects involved in the first group (Group A) attended the sailing course. The dismission of these subjects from their mental health service was the reason why it was not possible to assess the Group A three months after the post-treatment assessment (T2). The lack of follow-up measures did not allow to provide any information on longevity of outcomes and lasting effects of interventions and to perform a cross-over design. Finally, the use of control interventions that are not evidence based may have determined some bias in favour of the experimental intervention. The aims of mental health care of people with severe psychosocial disabilities should not be limited to aspects of clinical recovery, like symptoms control and functioning . Care should also aim to increase people’s abilities for a comprehensive social inclusion and to promote their health and well-being within the limitations caused by symptoms, as it is captured in the personal recovery concept . The findings of the present study pointed out that, when compared to more traditional group psychosocial rehabilitative activities, an intervention focused on sailing in a crew significantly promotes self-efficacy in people with severe psychosocial disabilities, and this might enhance the SoC and the QoL in the long term. Further longitudinal research is needed, also to better evaluate improvements on QoL and SoC. However, shortages in resources in the Sardinian public sector of mental health promotion  could not easily allow the development and implementation of psychosocial rehabilitative programs such as “VelaMente? !”, even if it respects many features of new ecological models in health promotion regarding physical activity interventions for people with psychosocial disabilities [68-71]. Each author gave substantial contribution to the study and the paper. FS and MGC participated in the design, conduction and coordination of the study, acquisition and analysis of the data and drafted the manuscript; GC, AC, SL participated in the conduction of the study and in the acquisition of the data; GT, AP, GM, FF participated in the recruitment of the subjects and acquisition of the data; AP, EPF, SM, AEN drafted the manuscript; MGC supervised all the activities. All authors have read and approved the final manuscript. The Sardinian Ethical Committee, Italy, approved the study protocol, which conforms to the Helsinki Declaration and its revisions: PG/2014/19645, November 27, 2014. All the participants were able to sign and provide a written informed consent; they presented also a medical note for non-agonistic sport activity and they obtained a health insurance against general accidents due to the sport activities. Nuernberg GL, Baeza FL, Fleck MP, Rocha NS. Outcomes of inpatients with severe mental illness: A naturalistic descriptive study. Rev Bras Psiquiatr 2016; 38(2): 141-7. Cardoso G, Papoila A, Tomé G, Killaspy H, King M, Caldas-de-Almeida JM. Living conditions and quality of care in residential units for people with long-term mental illness in Portugal--a cross-sectional study. BMC Psychiatry 2016; 16: 34. Stone RAT, Sabella K, Lidz CW, McKay C, Smith LM. The meaning of work for young adults diagnosed with serious mental health conditions. Psychiatr Rehabil J 2016. Sanchez-Moreno J, Martinez-Aran A, Tabarés-Seisdedos R, Torrent C, Vieta E, Ayuso-Mateos JL. Functioning and disability in bipolar disorder: An extensive review. Psychother Psychosom 2009; 78(5): 285-97. The WHOQOL Group. The World Health Organization Quality of Life assessment (WHOQOL): position paper from the World Health Organization. Soc Sci Med 1995; 41(10): 1403-9. Herens M, Bakker EJ, van Ophem J, Wagemakers A, Koelen M. Health-related quality of life, self-efficacy and enjoyment keep the socially vulnerable physically active in community-based physical activity programs: A sequential cohort study. PLoS One 2016; 11(2): e0150025. Mazzoni D, Cicognani E, Prati G. Health-related quality of life in systemic lupus erythematosus: A longitudinal study on the impact of problematic support and self-efficacy. Lupus 2016; 0961203316646459. Abraham KM, Miller CJ, Birgenheir DG, Lai Z, Kilbourne AM. Self-efficacy and quality of life among people with bipolar disorder. J Nerv Ment Dis 2014; 202(8): 583-8. Hansson L. Determinants of quality of life in people with severe mental illness. Acta Psychiatr Scand Suppl 2006; 113(429): 46-50. Bandura A. Social foundations of thought and action: A social cognitive theory 1986. Bandura A. Health promotion by social cognitive means. Health Educ Behav 2004; 31(2): 143-64. Bandura A. Self-efficacy: Toward a unifying theory of behavioral change. Psychol Rev 1977; 84(2): 191-215. Eccles J. Who am I and what am I going to do with my life? Personal and collective identities as motivators of action. Educ Psychol 2009; 44: 78-89. Eccles JS, Wigfield A. Motivational beliefs, values, and goals. Annu Rev Psychol 2002; 53: 109-32. Elliot AJ, Conroy DE, Barron KE, Murayama K. Achievement motives and goals: A developmental analysis, In Lamb ME, Freund AM, Lerner RM The Handbook of Life-span Development, Vol 2, Social and Emotional Development Hoboken, NJ: John Wiley and Sons Inc 2010; 474-510. Strecher VJ, DeVellis BM, Becker MH, Rosenstock IM. The role of self-efficacy in achieving health behavior change. Health Educ Q 1986; 13(1): 73-92. Noar SM. A health educator’s guide to theories of health behavior. Int Q Community Health Educ 2005-2006; 24(1): 75-92. Marcus BH, Selby VC, Niaura RS, Rossi JS. Self-efficacy and the stages of exercise behavior change. Res Q Exerc Sport 1992; 63(1): 60-6. Bauman AE, Reis RS, Sallis JF, Wells JC, Loos RJ, Martin BW. Lancet physical activity series working group. Correlates of physical activity: Why are some people physically active and others not? Lancet 2012; 380(9838): 258-71. McAuley E, Blissmer B. Self-efficacy determinants and consequences of physical activity. Exerc Sport Sci Rev 2000; 28(2): 85-8. Greimel E, Kato Y, Müller-Gartner M, Salchinger B, Roth R, Freidl W. Internal and external resources as determinants of health and quality of life. PLoS One 2016; 11(5): e0153232. Eriksson M, Lindström B. Antonovsky’s sense of coherence scale and the relation with health: A systematic review. J Epidemiol Community Health 2006; 60(5): 376-81. Forsberg KA, Björkman T, Sandman PO, Sandlund M. Influence of a lifestyle intervention among persons with a psychiatric disability: A cluster randomised controlled trail on symptoms, quality of life and sense of coherence. J Clin Nurs 2010; 19(11-12): 1519-28. Angermeyer MC, Matschinger H, Carta MG, Schomerus G. Changes in the perception of mental illness stigma in Germany over the last two decades. Eur Psychiatry 2014; 29(6): 390-5. Higgins A, Callaghan P, DeVries J, et al. Evaluation of mental health recovery and Wellness Recovery Action Planning education in Ireland: A mixed methods pre-postevaluation. J Adv Nurs 2012; 68(11): 2418-28. World Health Organisation. Towards a Common Language for Functioning, Disability and Health: ICF, The International Classification of Functioning, Disability and Health 2002. Corrigan PW, Watson AC. The paradox of self-stigma and mental illness. Clin Psychol Sci Pract 2002; 9: 35-53. Lattari E, Portugal E, Junior RS, et al. Acute Affective Responses and Frontal Electroencephalographic Asymmetry to Prescribed and Self-selected Exercise. Clin Pract Epidemiol Ment Health 2016; 31(12): 108-19. eCollection 2016. Stubbs B, Firth J, Berry A, et al. How much physical activity do people with schizophrenia engage in? A systematic review, comparative meta-analysis and meta-regression. Schizophr Res 2016; 176(2): 431-40. Carta MG, Maggiani F, Pilutzu L, et al. Sailing for rehabilitation of patients with severe mental disorders: results of a cross over randomized controlled trial. Clin Pract Epidemiol Ment Health 2014; 23(10): 73-9. Ramon S, Healy B, Renouf N. Recovery from mental illness as an emergent concept and practice in Australia and the UK. Int J Soc Psychiatry 2007; 53(2): 108-22. Thompson T, Lamont-Robinson C, Williams V. At sea with disability! Transformative learning in medical undergraduates voyaging with disabled sailors. Med Educ 2016; 50(8): 866-79. Aprile I, Iacovelli C, Iuvone L, et al. Use of a Virtual-Technological sailing program to prepare children with disabilities for a real sailing course: Effects on balance and quality of life. J Child Neurol 2016; 31(8): 1074-80. Recio AC, Becker D, Morgan M, Saunders NR, Schramm LP, McDonald JW III. Use of a virtual reality physical ride-on sailing simulator as a rehabilitation tool for recreational sports and community reintegration: A pilot study. Am J Phys Med Rehabil 2013; 92(12): 1104-9. Zimmermann R, Brendler R. [Sailing with the handicapped]. Rehabilitation (Stuttg) 1983; 22(4): 166-8. Hegemann T, Kratz G, Söderback I, et al. [Rehabilitative success of a social therapy sailing project]. Prax Kinderpsychol Kinderpsychiatr 1991; 40(2): 61-6.
 WHO. Classificazione statistica internazionale delle malattie e dei problemi sanitari correlati, 10ª revisione, 3 volumi 2000. Antonovsky A. The structure and properties of the sense of coherence scale. Soc Sci Med 1993; 36(6): 725-33. Sardu C, Mereu A, Sotgiu A, Andrissi L, Jacobson MK, Contu P. Antonovsky’s sense of coherence scale: Cultural validation of soc questionnaire and socio-demographic patterns in an italian population. Clin Pract Epidemol Ment Health 2012; 8: 1-6. Apolone G, Mosconi P, Quattrociocchi L, Gianicolo EA, Groth N, Ware JE. Questionario sullo stato di salute SF-12 Versione Italiana 2001. Schwarzer R, Jerusalem M. Generalized self-efficacy scale. Weinman J, Wright S and Johnston M Measures in health psychology: A user’s portfolio Causal and control beliefs, Windsor, UK, NFER-NELSON 1995; 35-7. Montag C, Haase L, Seidel D, et al. A pilot RCT of psychodynamic group art therapy for patients in acute psychotic episodes: Feasibility, impact on symptoms and mentalising capacity. PLoS One 2014; 9(11): e112348. Dunbar RI. The social role of touch in humans and primates: Behavioural function and neurobiological mechanisms. Neurosci Biobehav Rev 2010; 34(2): 260-8. Luttenberger K, Stelzer EM, Först S, Schopper M, Kornhuber J, Book S. Indoor rock climbing (bouldering) as a new treatment for depression: study design of a waitlist-controlled randomized group pilot study and the first results. BMC Psychiatry 2015; 15: 201. Antonovsky A. The life cycle, mental health and the sense of coherence. Isr J Psychiatry Relat Sci 1985; 22(4): 273-80. Antonovsky A. The salutogenic model as a theory to guide health promotion. Health Promot Int 1996; 11: 11-8. Antai-Otong D. Psychosocial Recovery and Rehabilitation. Nurs Clin North Am 2016; 51(2): 287-97. Mahlke CI, Priebe S, Heumann K, Daubmann A, Wegscheider K, Bock T. Effectiveness of one-to-one peer support for patients with severe mental illness - a randomised controlled trial. Eur Psychiatry 2017; 42: 103-10. Jennings CA, Berry TR, Carson V, et al. UWALK: the development of a multi-strategy, community-wide physical activity program. Transl Behav Med 2016; 7(1): 16-27. Craig CL, Bauman A, Latimer-Cheung A, et al. An evaluation of the my participACTION campaign to increase self-efficacy for being more physically active. J Health Commun 2015; 20(9): 995-1003. Richard L, Gauvin L, Raine K. Ecological models revisited: Their uses and evolution in health promotion over two decades. Annu Rev Public Health 2011; 32: 307-26.